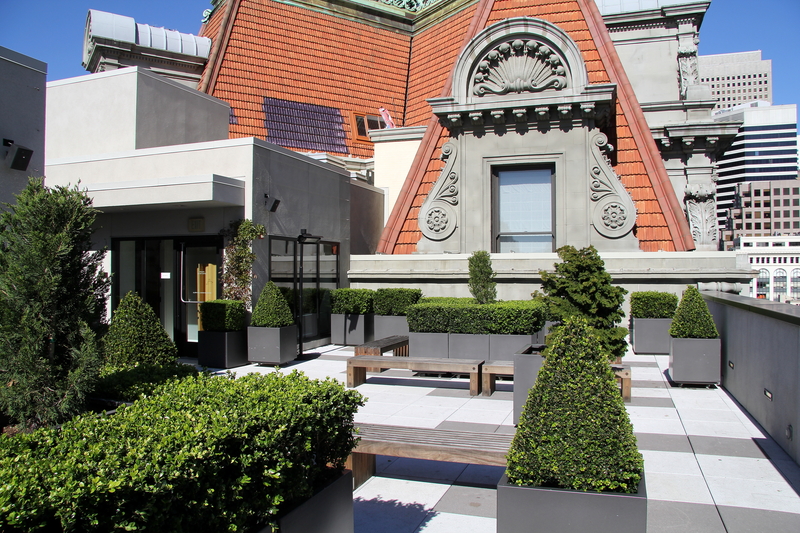 San Francisco’s rooftop greenery is part of a growing national phenomenon. Visit the top of Chicago’s City Hall or New York City’s new High Line Park (an abandoned elevated railway corridor replanted in gardens and walkways) and you will see similar central-city landscapes taking shape. 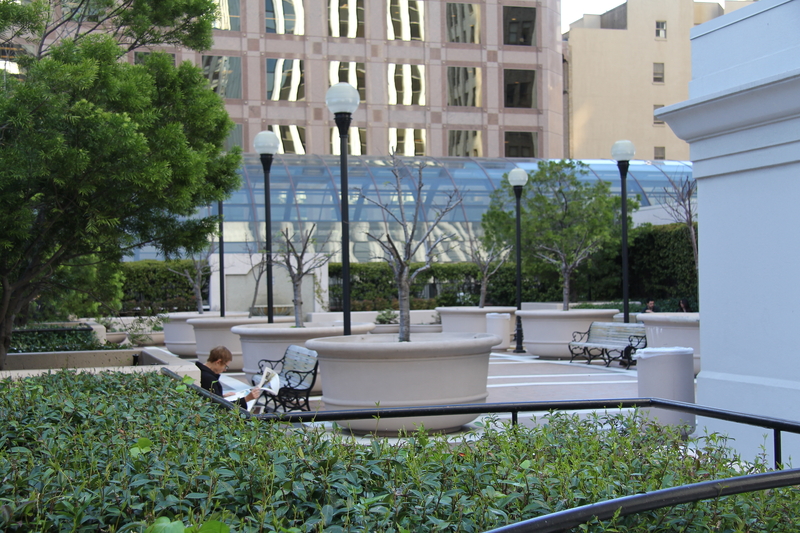 Some of these spots are specifically maintained as public places, but many are so-called POPOS (privately owned public open spaces) where access is often little advertised, gained through quiet stairways or high-rise elevators. Downtown San Francisco’s Financial District offers a particularly rich mix of these verdant little getaways. Where to start? 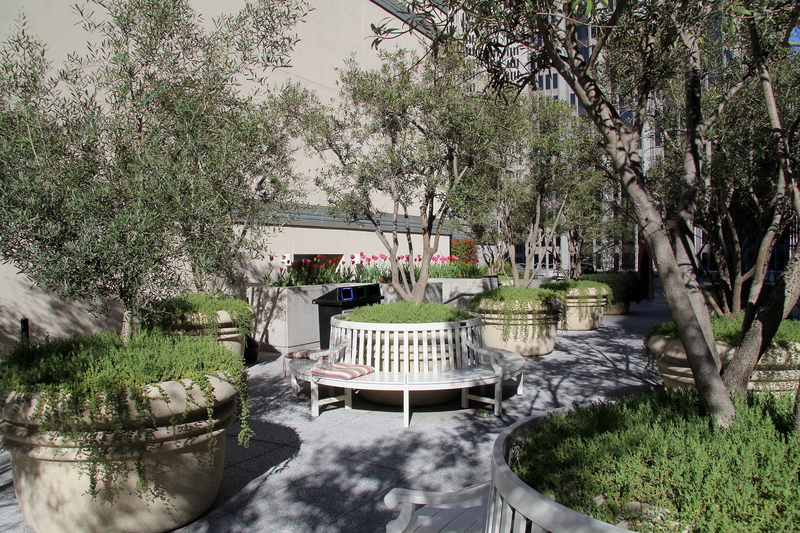 I took advantage of a great little guide to downtown San Francisco’s 68 POPOS, an online story on the city’s rooftop gardens that appeared in the San Francisco Chronicle, and a few suggestions from locals who had their own favorite spots. My first stop was a tiny high-rise oasis at 1 Kearny Street a few blocks from Union Square. I signed in with a security guard in the office building and less than a minute later the elevator doors opened to a great hideaway high above the city (Photo 1) where I sat and enjoyed terrific views of downtown (Photo 2). 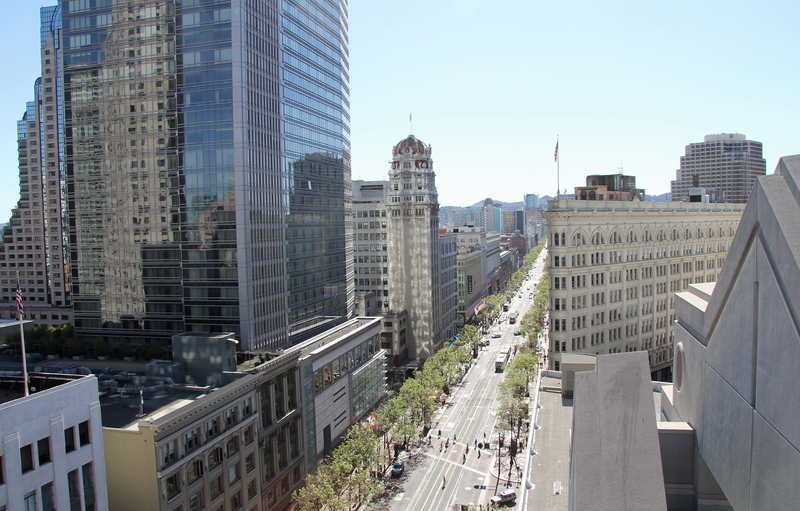 A few blocks away, I walked to the top floor of the Crocker Galleria (an indoor mall at Post and Montgomery). Two rooftop sun terraces are tucked above the shops (find stairways on the east and northwest sides of the mall). People chatted, enjoyed lunch, and grabbed a quick smoke in a landscape that offered benches and tables, urban greenery, and views of the surrounding skyline (Photo 3). 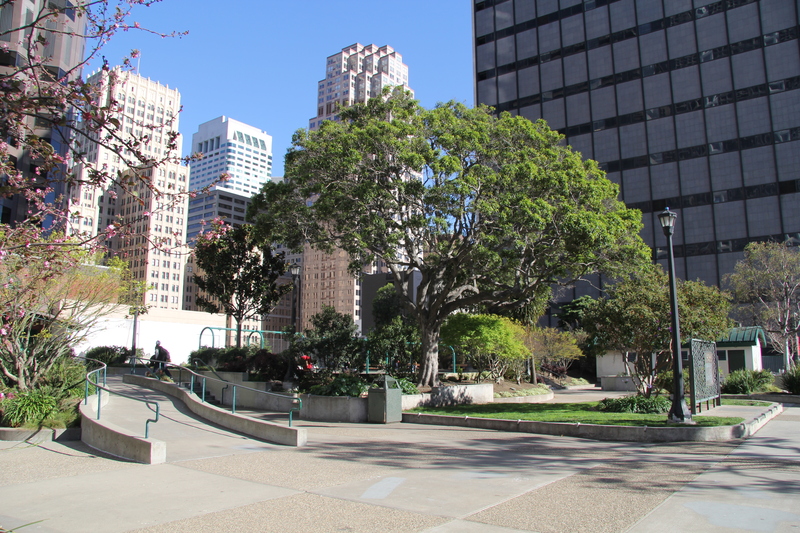 Next, a short stroll to Chinatown brought me to St. Mary’s Square, another delightful park that is built atop a parking garage (Photo 4). This is a diverse social space, great for people watching. Local building ordinances have also outlawed any new downtown construction that removes any potential sunlight from the park. I also walked down to the large convention hall (the Moscone Center) just south of Market Street. 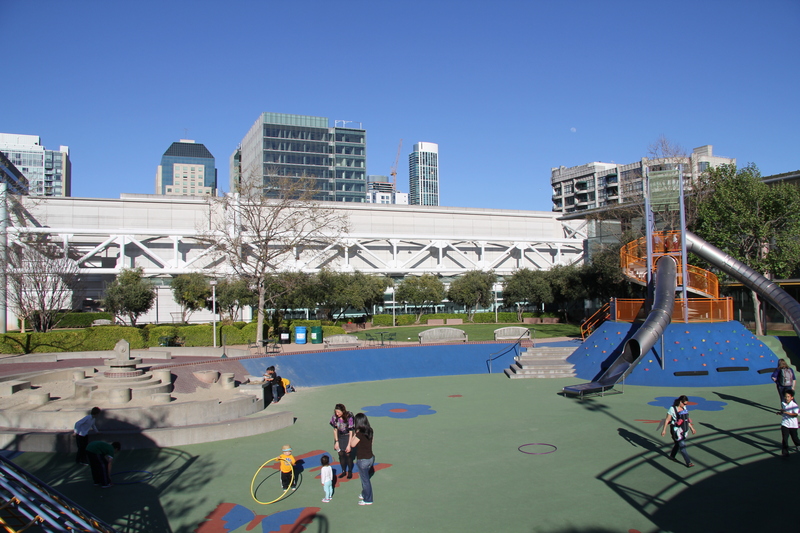 Although the complex looks like similar venues inside (meeting rooms, display areas, chain restaurants), the roof atop the Center is a delightful mix of green lawns, walkways, playgrounds, and open space (Photo 5). 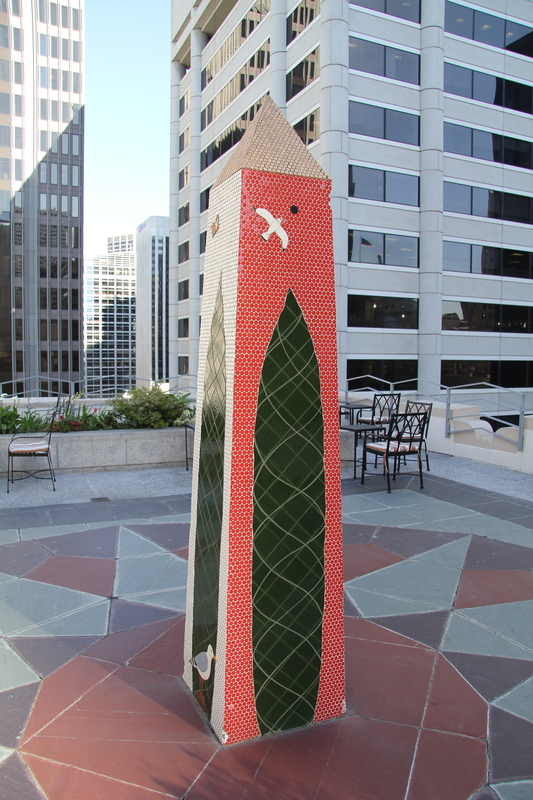 A short journey to the north brought me to one of my favorite rooftop sanctuaries on the 15th floor of another office building (343 Sansome Street). 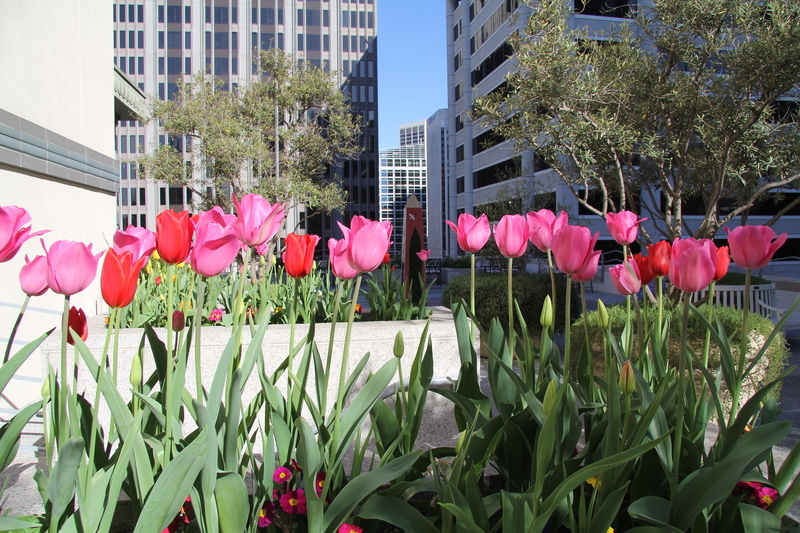 Open between 10am and 5pm, this POPOS greeted me with a planter of tulips, more places to sit and enjoy the view, and a great tiled obelisk (Joan Brown’s Four Seasons) (Photos 6–8). More elevated greenery is in the works. I walked by the giant Transbay Transit Center (near Market and First), still under construction, and imagined what the future “City Park” would look like. Planned to be one of the country’s largest rooftop parks, the 5.4-acre open space is designed to be the “green roof” of the Transit Center and will include botanic displays, water features, lawns, open space, and an outdoor performance venue. These brief rooftop visits were a great way to spend an afternoon and to understand some of the ways that new urban space is being created. They were also a reminder that cultural landscapes (and the field guides that explore them) are always works in progress, with plenty of opportunities for new discoveries. Thomas Balsey, a landscape architect in New York City, calls urban rooftops “the greatest untapped open space opportunity in America.” From what I saw, it seems likely that downtown landscapes will offer more rooftop parks and gardens in the future as urban planners, residents, and landowners find ways to make cities greener, more sustainable places. William Wyckoff is a professor of geography at Montana State University. His books, How to Read the American West: A Field Guide (2014) and On the Road Again: Montana’s Changing Landscape (2006) are both available from the University of Washington Press. Visit the author’s website to see a book trailer, sample chapters, and to read the foreword by William Cronon.